AIDA64 Engineer has a hardware detection engine unrivaled in its class. It provides detailed information about installed software and offers diagnostic functions and support for overclocking. As it is monitoring sensors in real time, it can gather accurate voltage, temperature and fan speed readings, while its diagnostic functions help detect and prevent hardware issues. 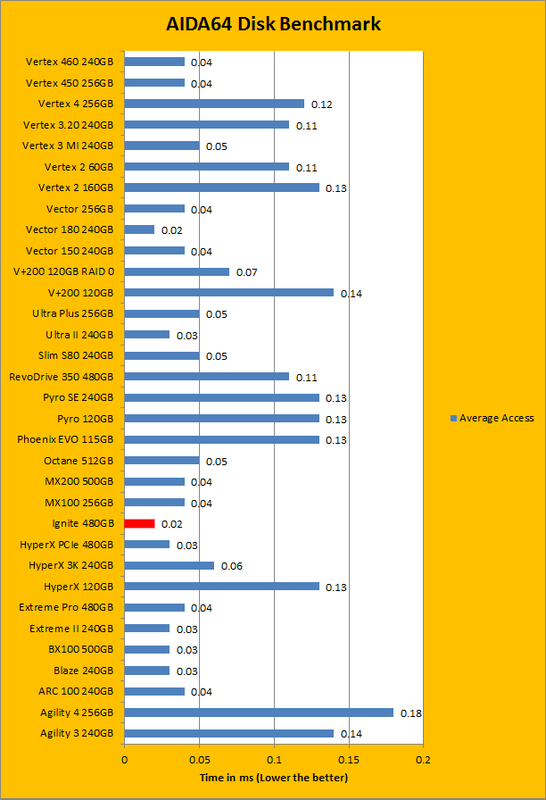 It also offers a couple of benchmarks for measuring the performance of individual hardware components or the whole system. It is compatible with all 32-bit and 64-bit Windows editions, including Windows 8.1 and Windows Server 2012 R2. If you have read our past reviews, whether we are testing hard drives, USB sticks, or solid state drives, you will know AIDA64 is one of our most used tests. AIDA64 Engineer is a completely synthetic benchmark in that it does not completely reflect real life performance. However, it provides an insight into the differences of performance between various drives and controllers. 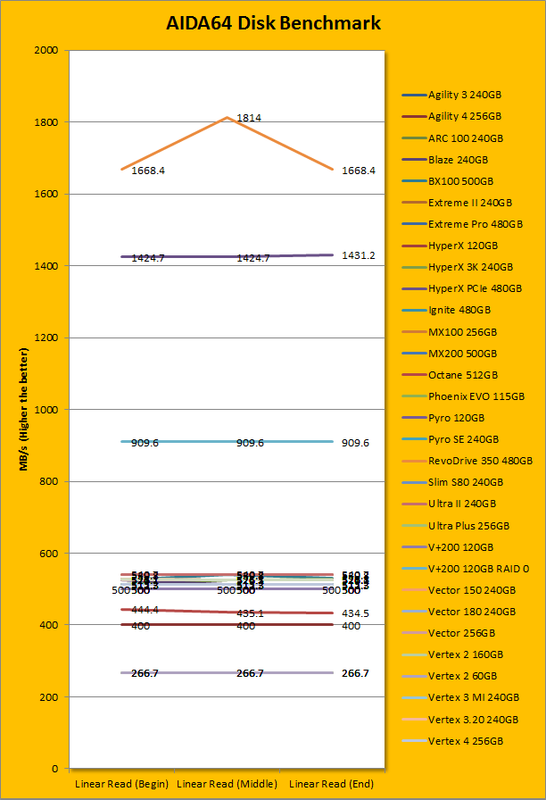 In the results displayed above, the Patriot Ignite 480GB performed quite well. 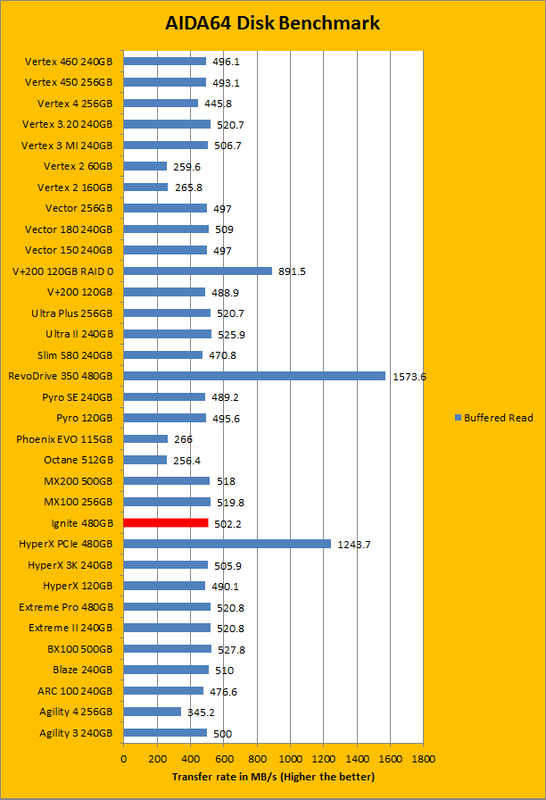 In fact, in the linear tests, the Ignite 480GB tied with both the Crucial MX100 and MX200 at a speed of 526.1MB/s. This handily beat the Patriot Blaze 240GB, whose numbers were 512.3MB/s for linear read. The random and buffered reads were recorded at 537.6MB/s and 502.2MB/s, which were both quite close to the Crucial MX series. I should mention these numbers were all behind the SanDisk Ultra II, one of our best performing SSDs at this dollars-per-gigabyte price bracket. As for average access time, the Ignite 480GB was among the lowest times at 0.02ms, which puts it in competition with the OCZ Vector 180. This is already a very good start for the Patriot Ignite 480GB. posted 15 hours and 22 minutes ago, with 1 posts. posted 15 hours and 23 minutes ago, with 7 posts. posted 15 hours and 25 minutes ago, with 6 posts. posted 15 hours and 27 minutes ago, with 14 posts. posted 15 hours and 28 minutes ago, with 58 posts. posted 15 hours and 28 minutes ago, with 13 posts. posted 15 hours and 29 minutes ago, with 10 posts.